Zeppelin Films is a London TV production company which was set up by former BBC Commissioning Editor, Elliot Reed. We have just started production on a brand TV new series looking at generational divides, for Channel 5. 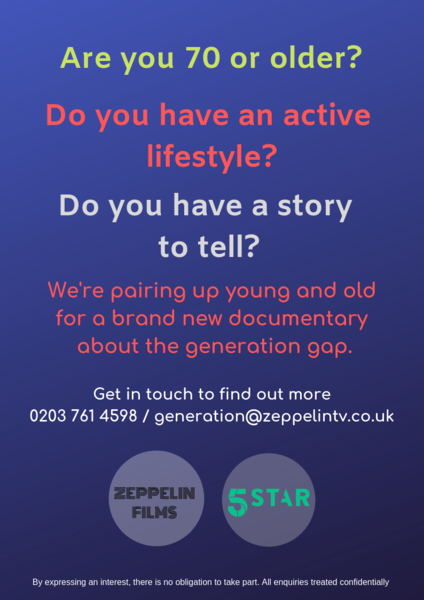 We are looking to make a series which bridges the generational gap by pairing up an 18-22 year old who could benefit from spending time with an older person, and a person over the age of 65 who has an interesting story to tell. By putting the two into each other’s world, our aim is that by the end of the process the two will hopefully see that there is not so much of a gulf between their experiences as they might think. We are looking for older people who will challenge conventions around the elderly and who are interested in finding out more about the lives of young people today. I would be very interested in hearing from anyone who has an opinion on young people. Perhaps you should include some kind of link or ‘contact me’ details? There's an e-mail and phone number on the poster. An 18-22 year old OMG I had enough getting my own to a civilised age (which is probably around 22) I don't want another one thank you. Although perhaps I should mine never wanted to listen to my stories. Do you suppose they will guarantee someone who won't put on a glazed expression when you start to tell them the story?